Creative Nail Design Systems’ Kolinsky sable Ultra Sculptor Brush adds speed and quality to sculptured nails and overlays. Dip the Ultra Sculptor Brush into Radical Solarnail Liquid; drain it completely. Draw a line through Solarnail Ultra White Tip Powder creating a patty Press it to the tip or form, creating a shiny dome. Press the middle of the patty to spread it, then the right and left side to moisten, creating the smile line Continue to press and smooth until the smile line and tip are shaped and smooth. Make sure that the entire nail plate is dean and dry. Dip the brush back into the liquid, then flatten and drain it. This time draw a line through Solarnail Ultra Blush Powder to form a medium-sized patty of product. Let the liquid absorb as described in Step I and then press the patty onto the nail plate, right next to the smile line. Press the patty to spread and moisten. Then ease the product toward the cuticle, leaving a tiny margin around the cuticle. 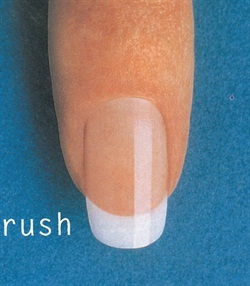 Press firmly with the flattened edges of the brush, then smooth product over the rest of the nail toward the tip. Keep the product thin at the cuticle. After product sets, finish the nails with a 240-grit abrasive and then fine-buff with SolarOil.